I am afraid of avocados turning into brown mush. I love guacamole but don’t dare to make it for everyday use because, unless you eat it all, it soon turns into bad, unappetizing brownish chunks. Avocadoes rapidly brown after they are cut open because their cells become exposed to air. The oxygen in air reacts with the enzyme polyphenol oxidase (PPO) and forms brown pigmentation called melanoidin. The avocado animation shows browning of an avocado from right after it is cut open to 300 minutes (5 hours) later. This polyphenol oxidase reaction often causes other produce, such as apples and potatoes, to brown. Often, polyphenol oxidase browning is desirable. Who doesn’t love the deep brown color of raisins, tea or coffee – all due to polyphenol oxidase browning. But, we do hate unappetizing brownish-green guacamole. People suggest many ways to prevent or slow down guacamole browning. One of my friend’s family members advocates putting avocado pits into the guacamole, while others suggest adding lime or lemon juice. Some folks swear by adding oils to prevent browning while others swear by wrapping it tightly (preventing oxygen). One of the most straight forward ways of reducing enzymatic browning is to apply heat (aka cooking) to denature polyphenol oxidase. However, cooking may lead to unfavorable texture and taste changes. Being curious, I decided to perform a mini experiment on avocado/guacamole browning. The first guacamole sample was the control with no additional ingredients –just avocados. According to my many Mexican American friends, putting the avocado pit inside guacamole is an age old tradition that is believed to reduce the browning of avocados. 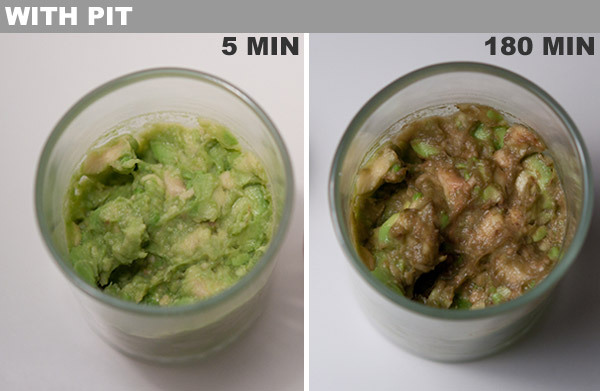 In our experiments, putting the pit in mashed avocados didn’t have any effect on its browning. On a side note, those small slippery avocado pits are big choking hazards. 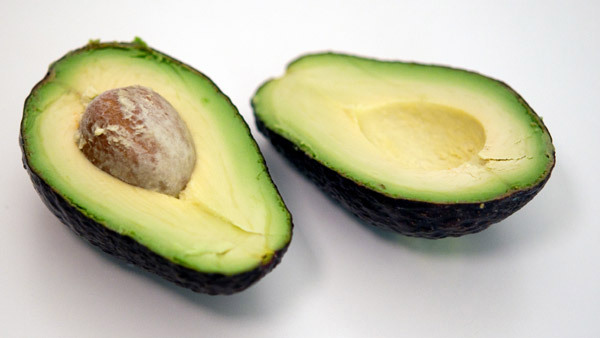 Adding ascorbic acid and citric acid can decrease the rate of enzymatic browning of avocados by lowering the pH of the tissue. Anywhere from 12 mg/oz to 1400 mg/oz of citric acid is found in lemon and lime juices. The phenolase responsible for browning are most active in the neutral pH range of 6 to 7 while there is no enzymatic activity, i.e., no browning, below pH of 3. 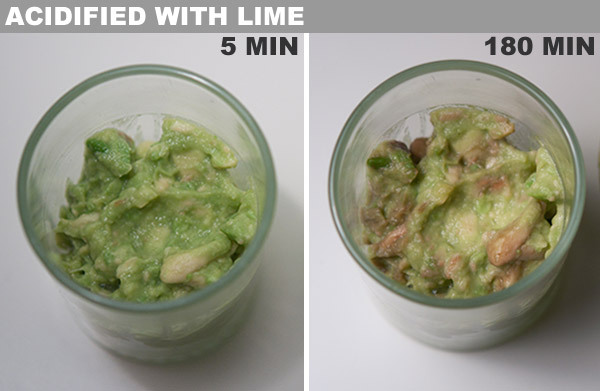 This experiment showed that adding the lime juice was the most successful at reducing the browning of the guacamole. Some recipes for guacamole include olive oil. I used to have two reasons for not adding olive oil in guacamole. The first reason is that avocado already has 15 % oil, whereas other fruits such as apple only have 0.2 % fat. 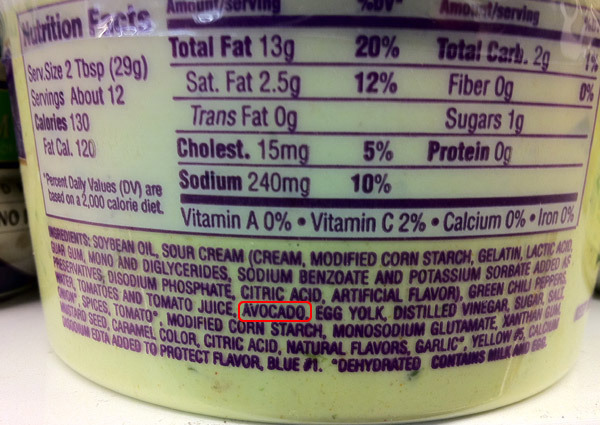 The second reason is that the unique flavors of the olive oils don’t go well with the avocadoes in guacamole. 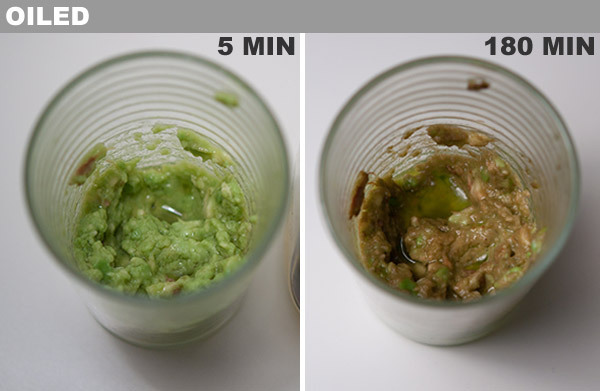 Now I have a third reason, adding oil slightly increased the rate of enzymatic browning of guacamole. One of the most essential seasonings for guacamole is salt. You can skip pepper, cilantro, or even lime, but not salt. Adding salt to guacamole seemed to drastically expedite enzymatic browning of avocados. Salted guacamole browned quickly, after only a few minutes of exposure to air. 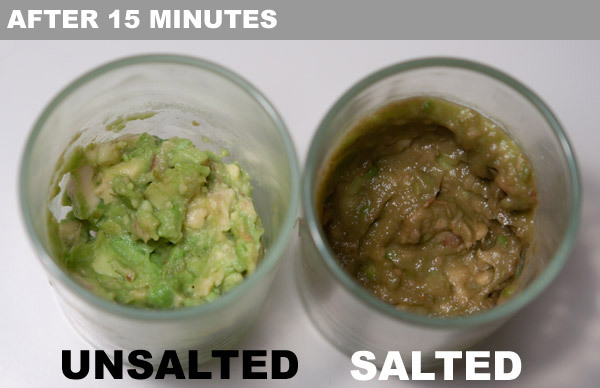 The image of unsalted and salted avocados after 15 minutes clearly shows that salt expedites the browning process in avocados. Tightly sealing guacamole by leaving no air between the plastic wrap and guacamole didn’t reduce the browning of guacamole. It is slightly better than open guacamole, but definitely had more enzymatic browning than the acidified (lime) guacamole. Avocados refrigerated at 5 °C or 40°F did far better than avocados stored outside. 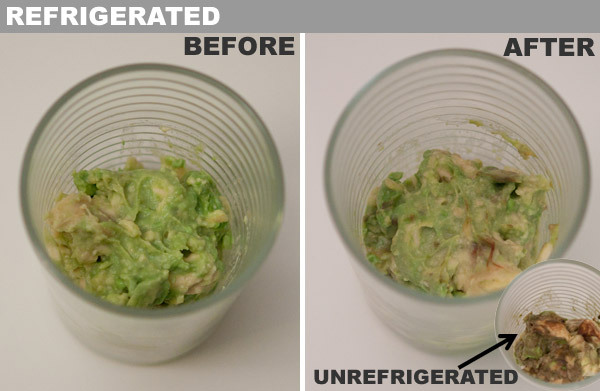 The refrigerated guacamole still looked green while the surface of the guacamole stored outside turned completely dark brown (as shown on the inset). During my first experiment, I forgot to put the guacamole designated for the refrigerator inside of it. I conducted the experiment again with a different batch of avocados. 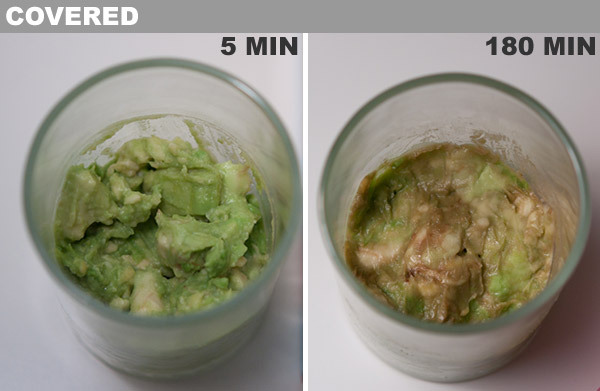 This resulted in a different time scale for browning of the avocado, but the ultimate before and after result remains the same. These mini experiments were conducted on three batches of generic avocados bought from local stores. 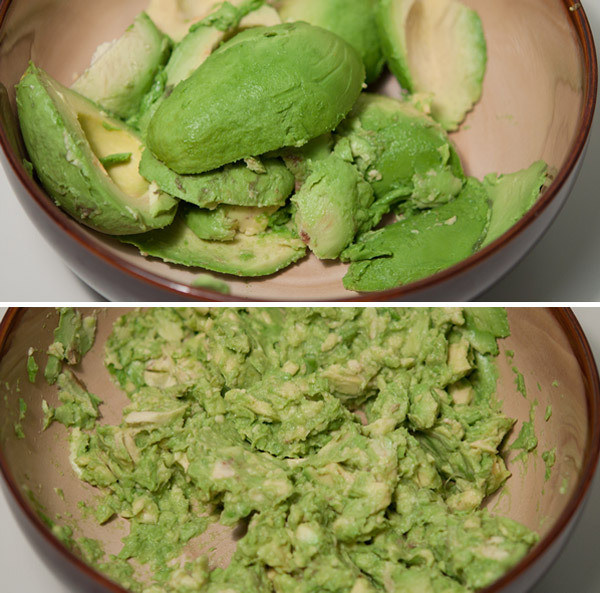 The browning results for each batch of guacamole differ due to the cultivar (variety) of the avocado, ripeness (other aspects) of the avocado, and its storage conditions (humidity, temperature etc.). 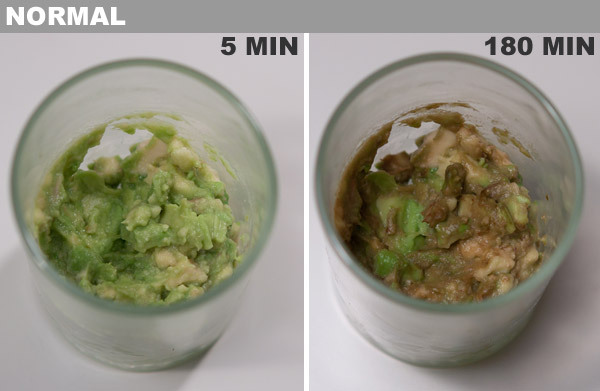 For example, in most of the experiments noticeable browning of mashed avocados started within 3 hours, while in other experiments browning barely started around 6 hours. Fresh guacamole is very easy to make. To make homemade guacamole cut and mash the avocados and add seasonings, such as lime juice, salt, pepper, garlic, cilantro, hot sauce, tomatoes, and onions. The store bought guacamole is preserved by high pressure vacuum packaging, and by adding a lot of preservatives to add to shelf life. Many filler ingredients, such as oils and starch are added to reduce cost. In 2006, a Californian sued Kraft food because their guacamole had less than 2 percent avocados and instead was filled with food starch, oils, and food coloring. An example of a refrigerated guacamole on sale in a grocery store shows that this commercial guacamole has no less than 36 ingredients, avocado being the 18th item on the list. 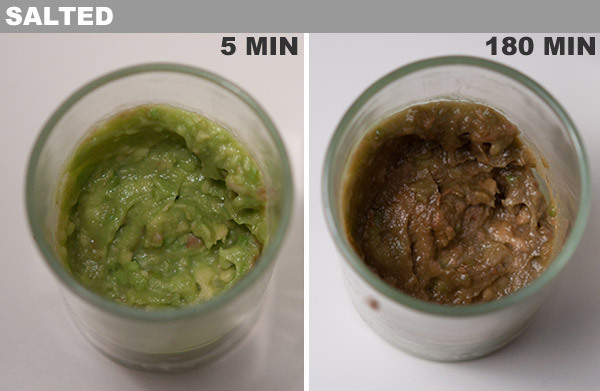 How to reduce browning of guacamole? Cut and mash avocados just before making guacamole. Make sure to prep other ingredients beforehand. Add lime/lemon juice (according to taste) right after mashing avocados. Cover it up with plastic wrap. Delay adding salt until the last moments before serving the guacamole. thanks for debunking this romantic notion. I will remember to use lime/lemon juice and delay the salt till the end. Thanks again! This is pure genius! Love the idea. Love the write-up. Love the photos. If you have leftovers of your guacomole, it’s probably a sign it doesn’t taste good anyway… but you now prove there are more reasons why you shouldn’t eat guacomole that is stale (and is salty)! Congrats. & Thanks for informative experiments. Glad you love avocados and were willing to take all those photos! Bottom line: peel your avocado and eat it up!